This Valentine’s Day, stand out from the crowd by giving the special lady in your life beautiful, innovative jewelry that will make her look and feel good. For the health enthusiast, the sophisticated woman, the girl with grace and style, Philip Stein’s new wellness jewelry and timepieces are timeless and chic, with diamond encrusted accents, and precious metals, serving as the perfect gift for your loved ones. Luxury wellbeing lifestyle company Philip Stein offers a way to live in tune in a fast-moving world. 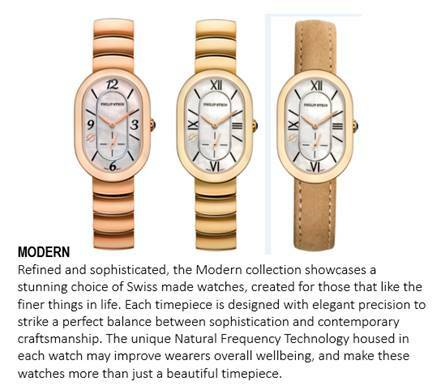 Known for creating high-quality accessories and noted for incorporating wellness into its product line, Philip Stein embeds Natural Frequency Technology into its elegant, iconic pieces to help improve sleep, reduce stress and enhance overall wellbeing. 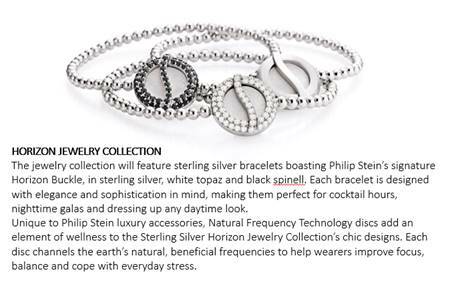 Sterling Silver Horizon Jewelry Collection retails $350 – $695. Modern collection retails from $795 – $850.